Dura Faucet is a leading RV faucet manufacturer and is proud to be a part of this great American tradition. 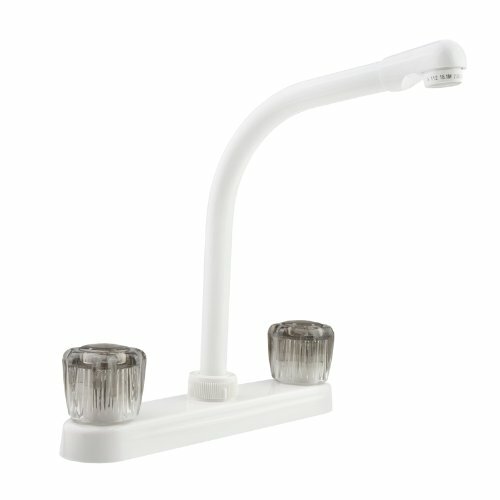 This elegant Hi-Rise RV Kitchen Faucet is the perfect add-on for your home on the road. Enjoy the peace-of-mind that comes with buying a Dura Faucet. Our RV shower accessories are manufactured using heavy duty material which means years of uninterrupted use. Our wide selection of RV accessories will make a great for a great upgrade to your home on the road. FEATURES | This faucet boasts an elegant and classic exterior, and two smoked crystal acrylic knobs to adjust temperature and water pressure. Enjoy splashless washing due to the generous aerated stream. DESIGN | The hi-rise styling of this faucet is the perfect solution for updating your sink. This unit is made with premium lightweight synthetic waterways, metal plated plastic construction and a brass spout. QUALITY | This dual knob faucet comes with an easy-to-turn design, and provides a smooth turning action, while preventing unwanted dripping. As with all our products, this model is lead-free-certified. INSTALLATION | If you are concerned about adequate space on your sink top to accommodate this faucet, don't worry! It was made with a recreational vehicle's limited space in mind. SPECIFICATIONS | Works on any 2-hole sink opening. Just over 10" high, and knobs are just under 3" high. Flow rate is 2.2 GPM. Drip-free washerless cartridges. UPC- and CUPC-Certified. If you have any questions about this product by Dura Faucet, contact us by completing and submitting the form below. If you are looking for a specif part number, please include it with your message. BK Resources BKF-VSMPR-WB-G Lead Free Work Force Value Pre-Rinse Faucet, 8", Splash Mount, Under 5"